It was a while since I featured something with monochromatic appeal which is why I was excited when this popped up on one my favourite Swedish blogs Stil Inspiration today. 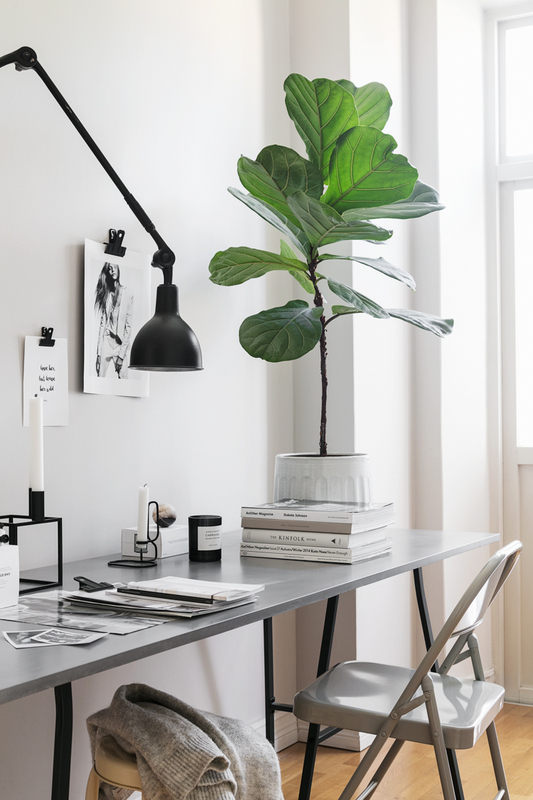 Located in Örebro, The space belongs to Maria Karlberg, an interior designer, blogger and "creative Mom to a magical daughter." The clean lines and marriage of black, white and wood furniture with a concrete floor remind me of the beautiful starkness of the nordic landscape in winter, while soft textiles and textured surfaces add a warm and inviting feel. No wonder it caught the eye of Pella Hedeby and Sofi Sykfont who captured it for this months' edition of Elle Decoration Sweden! Enjoy the tour! So striking! I particularly love the dining space and bedroom areas. 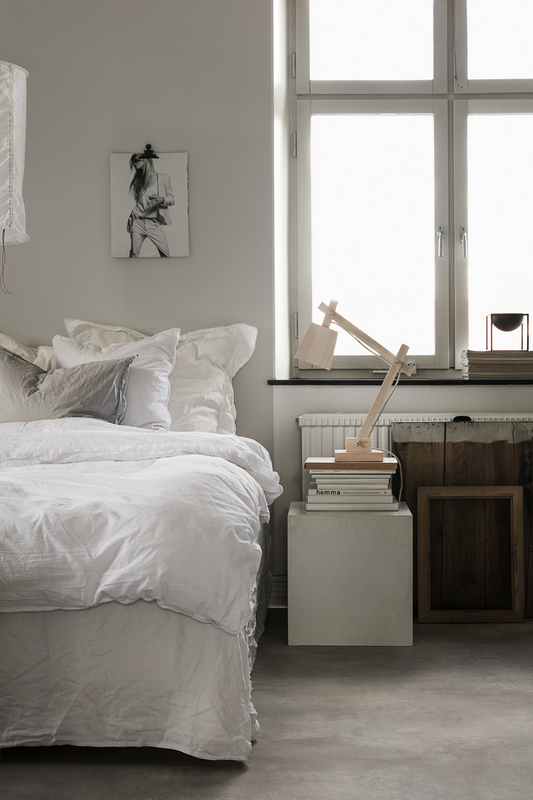 .....And that stonewashed linen bed skirt against the concrete floor is so beautiful! (this bed skirt / coverlet is similar!). 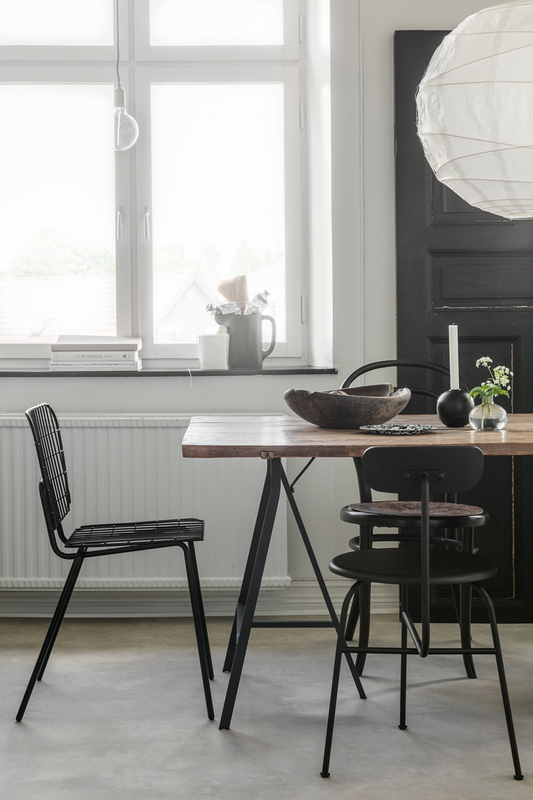 A few items I know and love: dining room - Menu Afteroom dining chair, Kubus bowl (black). Office - Lampe gras. Bedroom - ConceptBetong bedside table, Muuto wood lamp. 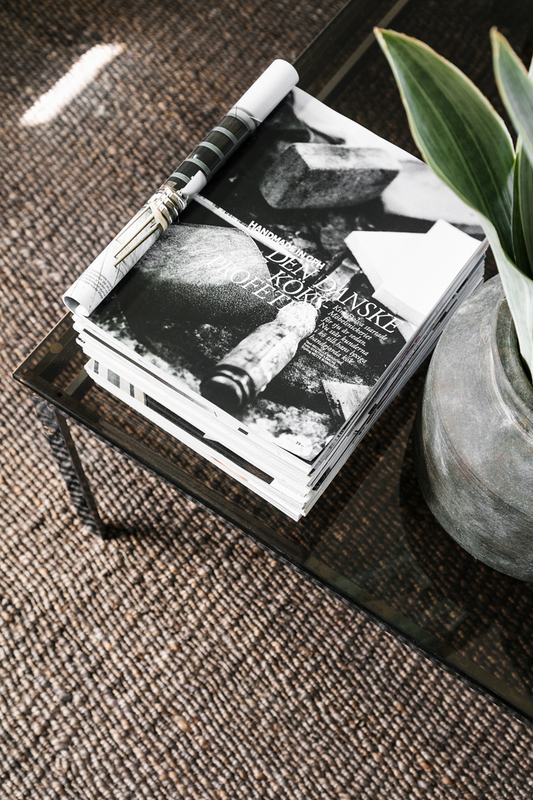 Pick up a copy of this months Elle Decoration Sweden (it's a beautiful magazine for inspiration even if you don't understand Swedish!) to see the full tour. And if you're up for a little more monochrome inspiration today, put your feet up and enjoy this archive! PS I had a great evening chatting with the guys at LiveHappy about my Lagom book - the podcast is now live if you fancy a listen! Photography: Sofi Sykfont / Styling Pella Hedeby (shared with kind permission). I am intrigued by the second photo. What is the black bowl? An indoor firepit, a sink, a bowl for floating candles and/or flowers? Thanks for your previous reply about storage. I am a storage obsessive, as I live in a modern house with no cupboards! 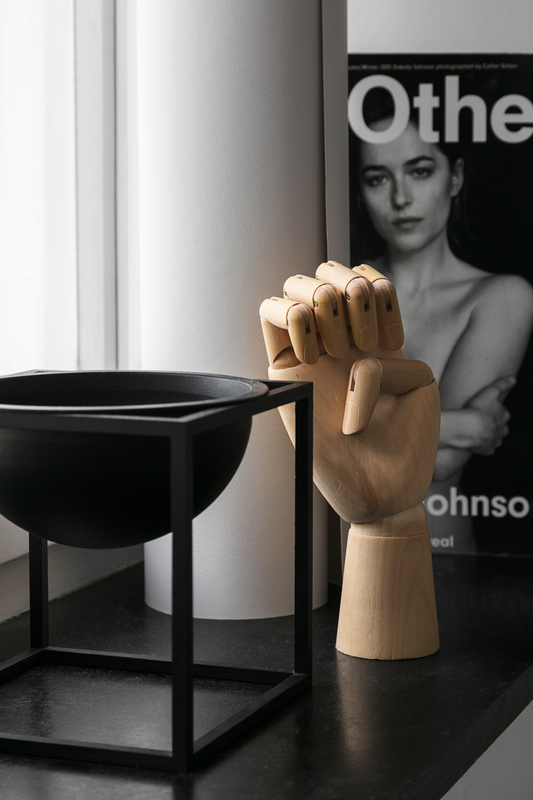 It's a bowl that you can keep little things in like nuts, sweets or whatever! I can understand your storage frustration - not sure we'd manage without ours (although they're a little on the full side!). Do you have a source for the dining table? Sadly not, I hope someone else might be able to help you!